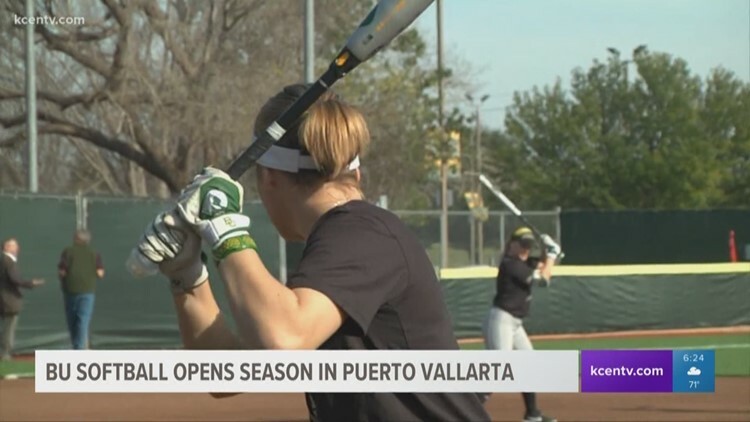 PUERTO VALLARTA, Jalisco — 18th-ranked Baylor softball (1-1) split its opening day contests with a thrilling 4-1 upset over No. 9 South Carolina and a narrow 4-3 loss to BYU at the Puerto Vallarta College Challenge in Puerto Vallarta, Mexico. The team’s win over ninth-ranked South Carolina is the first top-20 win in a season opener in program history, besting the 2011 team that defeated No. 24 Illinois to open their campaign. Three Bears were walked to open the contest, and Kassidy Krupit was walked to score the first run of the season courtesy of Nicky Dawson. Taylor Ellis made it a 2-0 lead after she hit a sac fly to left field and scored Lou Gilbert. The Gamecocks (1-1) got on the board with a sac fly from Madison Owens to pull within one, but the Lady Bears would stretch the lead with a two-run fourth inning to make it a 4-1 lead. Hannah Smith bunted and reached third base on a throwing error to bring Maddison Kettler home. Then, Ana Watson singled up the left side to bring in Smith to seal the win for the Bears. The Lady Bears finished the game by leaving seven Gamecocks on base. Sidney Holman collected the win after pitching 5.1 innings and produced her first Baylor strikeout. Maddison Kettler went for 2-for-3 behind the plate to lead the Baylor offense. Baylor quickly got back into action and scored using a Goose McGlaun sac fly for the early 1-0 lead. BYU answered right back with a sac fly to tie the game at 1-1 after one inning. The Cougars (1-1) did some damage in the second, scoring three runs on four hits on a single and a double to take the 4-1 lead. Baylor didn’t score until the top of fifth, using a Hannah Thompson single to bring in McGlaun and Ellis to make it a 4-3 game. With the Baylor defense leaving the bases loaded in the sixth, a Baylor pop-up ended the game with bases loaded in the seventh. • Baylor is 22-12 all-time in season openers and 15-4 under head coach Glenn Moore. • Baylor collected its first program win against South Carolina on Thursday. The Gamecocks now lead the all-time series, 3-1-1. • Baylor is now 1-2 all-time against BYU. • Nicky Dawson was 4-of-7 at the plate with a .714 slugging percentage on Thursday. • The Baylor pitching staff combined for nine strikeouts, including a team-best four by Regan Green and Madison Lindsey. • Madison Lindsey pitched 4.1 innings and maintained a 0.00 ERA in her first collegiate games. • Six newcomers made their Baylor debut on Thursday. • Baylor is now 1-1 in tournament play, tying with South Carolina and BYU after one day of competition. • Baylor is now 1-0 against ranked opponents in 2019, going 4-8 against ranked foes last season. • Baylor is 1-1 when scoring first in 2019. 9 – the ranking of BU’s first opponent of the season that gave the Bears a top-20 win in a season opener for the first time in program history. The Lady Bears (1-1) continue action at the Puerto Vallarta College Challenge with a 3 p.m. CT game against North Carolina Friday.